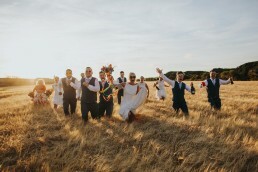 Millie and Doug won a competition ages ago to get their wedding photography for free. We had an amazing pre-wedding shoot on the gorgeous North Norfolk Coast. You can check this out HERE. Anyway, on to the wedding. Millie and Doug planned to get married at Lingwood church with the party afterwards being held at the fantastic Southwood Hall. The day started with Millie getting ready at Southwood. Joining her, the very talented Kirstie Barton and Deb Dominic killing it on Make-up and Hair! The gorgeous florals put together by Kelly from Fig Flowers. After a super fun morning and some wasp killing, we made our way to the church for the ceremony! The ceremony was beautiful, it’s always really nice to see such good people come together to celebrate their love for each other. Ceremony done and with the rain coming down, we got a confetti line made up. Millie and Doug ran down the church path, brollys in hand and smiles on their faces! Nothing like a quick downpour to get people in the mood for a beer! So back to Southwood we went. Arriving under heavy rain, everyone made their way inside for drinks. The ever-brilliant Bill Downs played and sang as guests mingled and chatted. Millie and Doug arrived and the food was served. Speeches followed and Doug’s pals made him pay with a somewhat questionable choice of toast drink. Imagine all the spirits, add Germolene and you’ve got it! Rank, funny but rank!